BAM! One of my favorite chefs has opened a restaurant at Grand Boulevard. 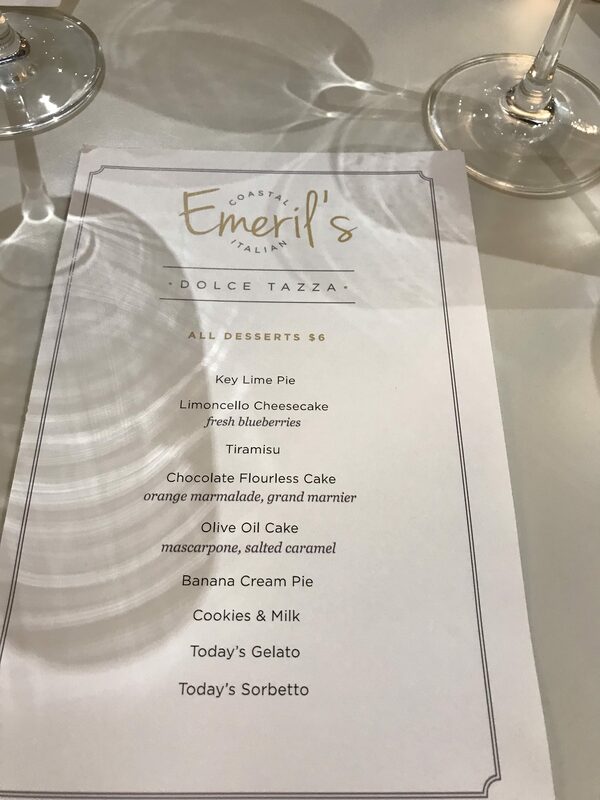 Emeril’s Coastal Italian combines my two favorite – Italian cuisine and seafood. The tiramisu and olive oil cake are heavenly as well. Yes ‘olive oil cake’ – more on that later! You can watch your meal being prepared from almost every table. I prefer reserving a spot at the ‘food bar’. From the bar you can watch the chefs prepare your meal. You might get lucky enough to watch Emeril himself! The menu includes Italian favorites such as house made meatballs, Lasagna Bolognes and plenty of other pasta dishes to satisfy the carb lover. Fresh seafood from the gulf and local ingredients are also on the menu. The wine selection does not disappoint either. We have enjoyed celebrating birthdays and our anniversary but you don’t need a special occasion to enjoy a good meal. The food is fresh, creative and delicious. Need I even mention dessert?? After much contemplating we had the tiramisu and olive oil cake. I was very hesitate on the olive oil cake but our waiter had suggested it as it was one of their top desserts. It is much like a spice cake but with twist. Of course the tiramisu rivaled my husband’s Italian grandmother’s recipe. My birthday celebration was completed with homemade cotton candy served with an over sized sparkling candle. Dress is Island casual – no sleeveless shirts for men. Reservations are recommended during the busy season. Lunch & Dinner: 11:30 a.m. – 10 p.m. Lunch & Dinner: 11:30 a.m. – 10:30 p.m.